SUMMER VETERINARY EXPERIENCE 2016 The Wildlife Institute (WI) is excited to launch our Summer Veterinary Experience in Summer 2016. 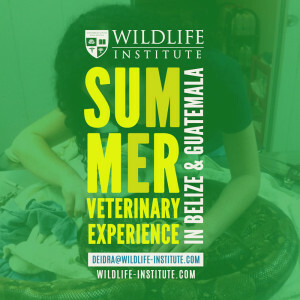 The Summer Veterinary Experience offers a month of study of Wildlife Medicine & Conservation and Small Animal Veterinary Experience (SAVE) in partnership with the Belize Wildlife & Referral Clinic (BWRC). These open-enrollment veterinary courses are now open for registration for veterinary, vet-tech and qualified pre-vet students. The Summer Veterinary Experience is ideal for final year vet students seeking externship or clinical rotations, and first and second year students seeking hands on experience and an introduction to a range of diverse veterinary topics. During Wildlife Medicine & Conservation, students join the BWRC veterinary team for a two week course at the clinic and in the field with wildlife projects around Belize and the region. During SAVE, students are introduced to essential clinical skills which they then put to use during community health and spay & neuter clinics in communities around Belize. WILD SPRING BREAK 2016 This exciting course includes traditional lectures, field visits, experiential learning and hands-on labs. The Wild Spring Break Course is a condensed version of the Wildlife Medicine & Conservation Course. This session is open to Vet and Pre-vet students. The Wild Spring Break Course is an intensive introduction to key topics in wildlife medicine and conservation issues in the neo-tropics. Students learn about wildlife medical issues and approaches, the role of the veterinarian in wildlife conservation, zoo medicine, and wildlife rescue & rehabilitation. Much of this course is held at the Belize Wildlife & Referral Clinic’s (BWRC) teaching facility with BWRC’s founder and wildlife veterinarian, Dr. Isabelle Paquet-Durand. Labs include distance immobilization, suture, necropsy, comparative anatomy, radiography, parasitology, and blood analysis. Students also have the opportunity to observe, and when possible, assist the BWRC and other facility veterinary staff with daily treatments and husbandry. Apply today for a spring break like never before! 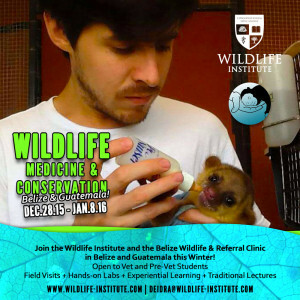 WILDLIFE MEDICINE & CONSERVATION 2015-2016 The Wildlife Medicine & Conservation course is an intensive introduction to key topics in wildlife medicine and conservation issues in the neo-tropics. Students learn about wildlife medical issues and approaches, the role of the veterinarian in wildlife conservation, zoo medicine, and wildlife rescue & rehabilitation. Students are introduced to preventative medicine and common diseases for various wildlife species. Students visit a number of wildlife rescue, rehabilitation and conservation projects and centers around Belize and the region. 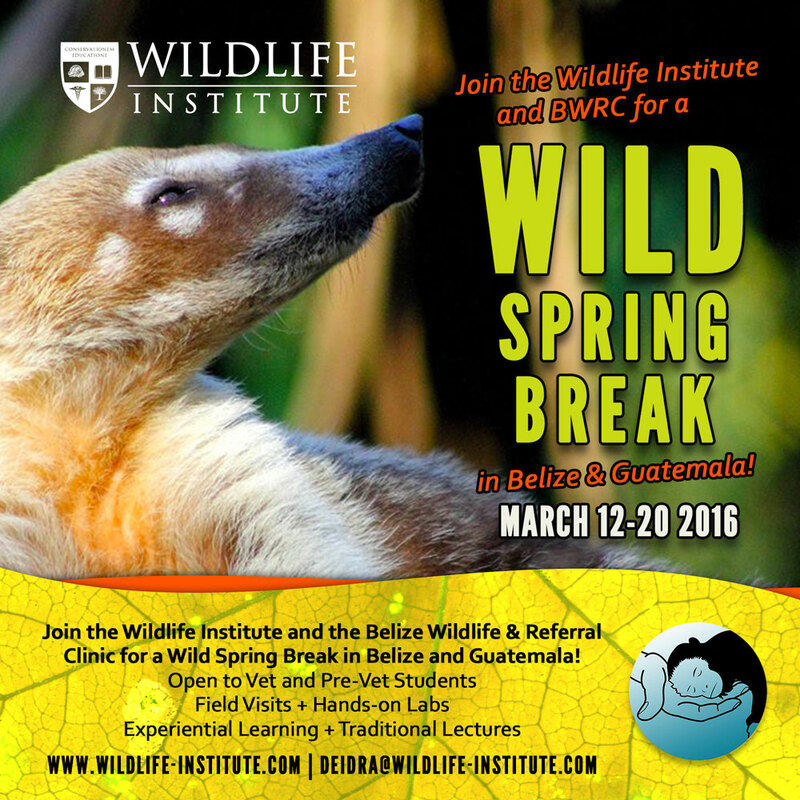 Email our Assistant Registrar Deidra Smith: deidra@wildlife-institute.com for details on these Veterinary Courses in Belize & Guatemala.